In Stock - Order before 2pm for same day dispatchWant it on Tuesday 23 April? The Daily Devotional Bible for Women: NKJV Edition is designed to connect God’s Word with the deepest needs of your heart. One of the challenges of Bible reading is knowing where to start. Crafted by a culturally diverse team of women for women, the devotional resources offer insights from multiple perspectives spanning various ages, backgrounds and experience. As a result, the Daily Devotional Bible for Women: NKJV Edition provides a systematic plan for applying God’s wisdom and guidance for all stages of your life. The Daily Devotional Bible for Women: NKJV Edition features the beloved New King James Version (NKJV) translation. The NKJV is modern and easy-to-understand, capturing the beauty and majesty of God’s Word in contemporary English yet retaining the purity and stylistic beauty of the original King James Version of the Holy Bible. NKJV Daily Devotional Bible for Women, Purple/Blue LeatherTouch by Holman Bible Staff Holman Bible Staff was published by B&H Publishing Group in April 2019 and is our 6392nd best seller. The ISBN for NKJV Daily Devotional Bible for Women, Purple/Blue LeatherTouch is 9781535935241. Be the first to review NKJV Daily Devotional Bible for Women, Purple/Blue LeatherTouch! Got a question? No problem! 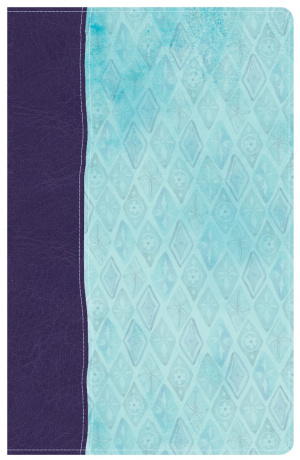 Just click here to ask us about NKJV Daily Devotional Bible for Women, Purple/Blue LeatherTouch.